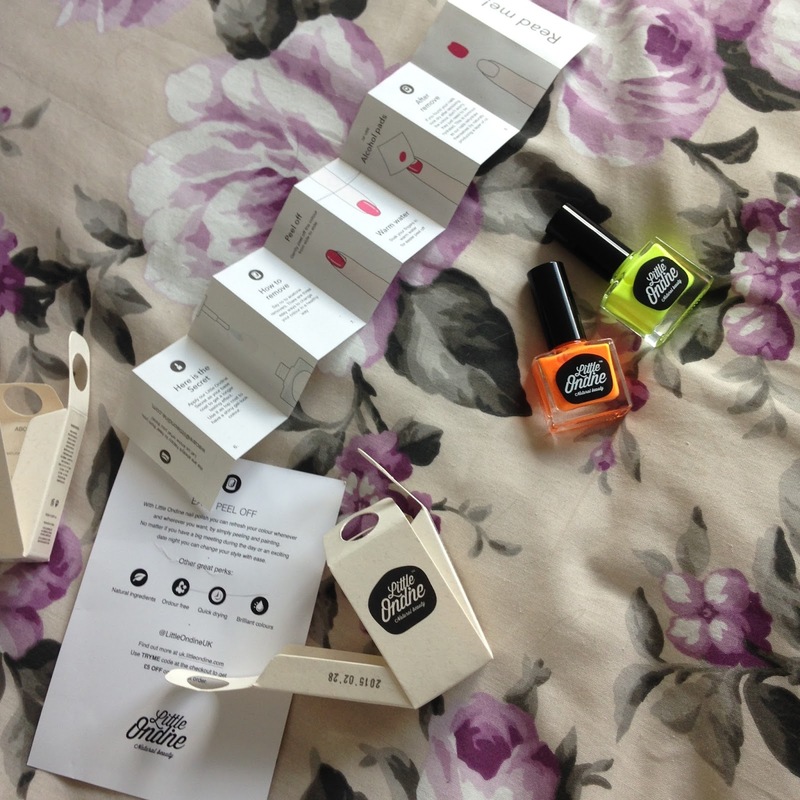 A few weeks ago Rachel from Little Ondine contacted me and asked me if I would like to try and review their nail polishes. I said yes straight away, as I'm sure you can tell! Now, these aren't just any ordinary nail polishes. They have some really special and unique elements that make the product so different and innovative compared to any other nail products you might find on the high street! 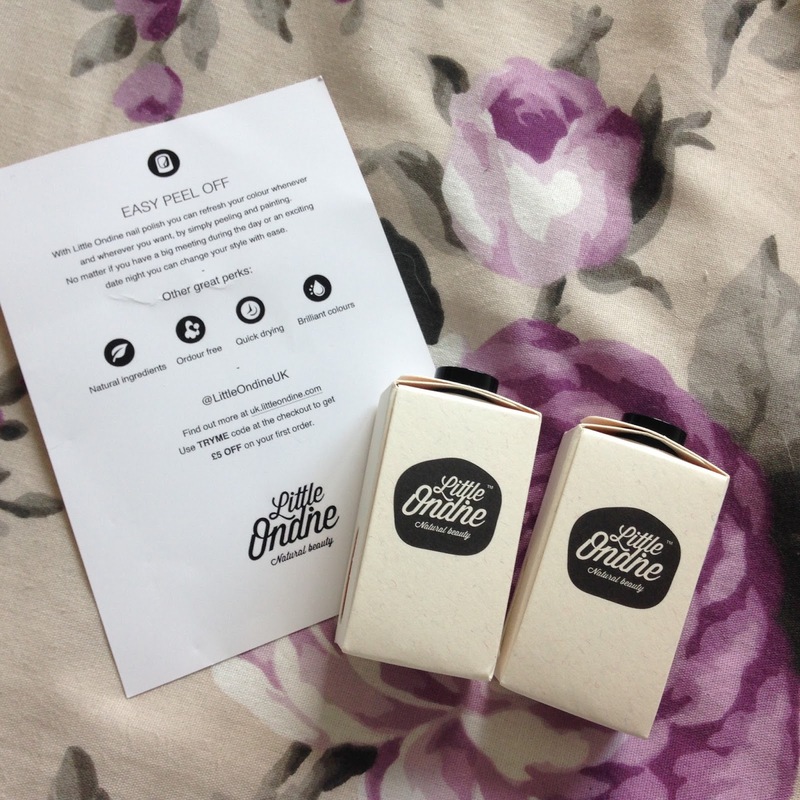 The products arrived in absolutely beautiful packaging with a little introductory letter about the product. The originality of the product is all based around the fact that it is an easy peel off polish! 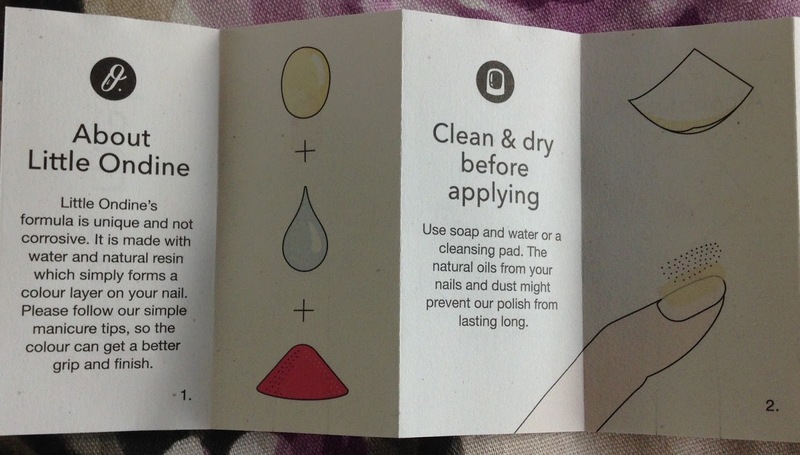 These means that the product is removable without any need for nail polish remover and is 10x quicker to remove! Not only does this polish save you money in the long run, because you don't have to spend excessive extra amounts on nail polish remover and cotton pads, it's also a healthy alternative for your nails! Using acetone nail polish remover on your nails routinely is not good for you natural nail and can actually lead to weakness of the nail and flaking! Another reason I fell in love with this product was because of just how easy it is to apply! The brush is slightly different to most ones you'll find in high street nail polish bottles. The bristles are a lot softer and the brush itself is wide and covers the whole nail in just one stroke. The colours that were sent to me were "Boom" and "Smack". Both are really vibrant colours that are completely perfect for summer! 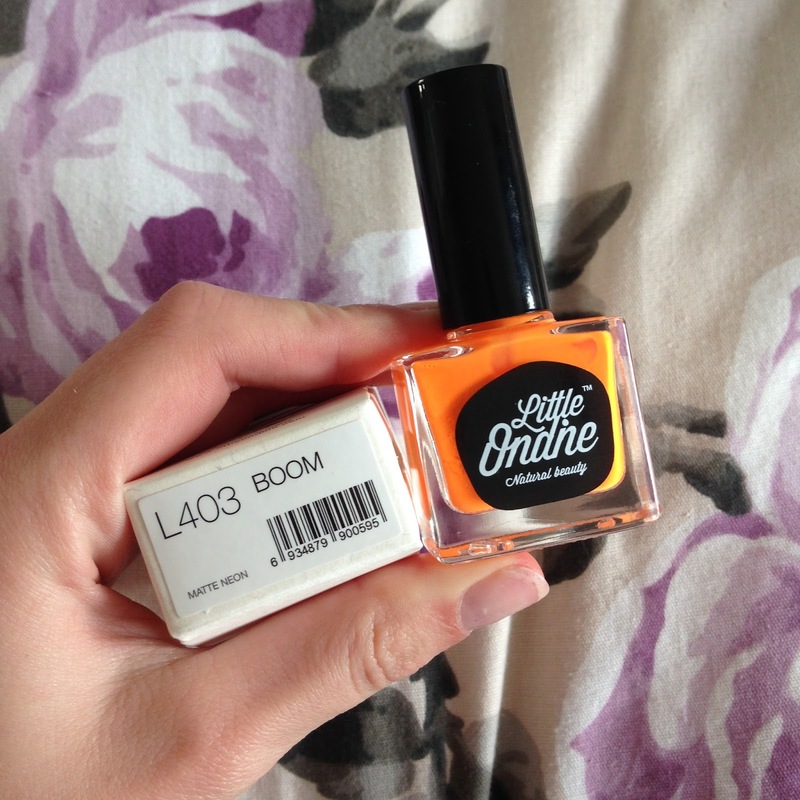 Boom is an amazingly bright orange that catches anyone's attention straight away. Just walking past a mirror in my house I would see something really bright and have to take a second glance just to realise that it was my nails! So, to properly test the product out for you all, I decided to wear L402 Smack on my nails throughout the week and see how much I liked it. First of all, I think the colour is gorgeous! 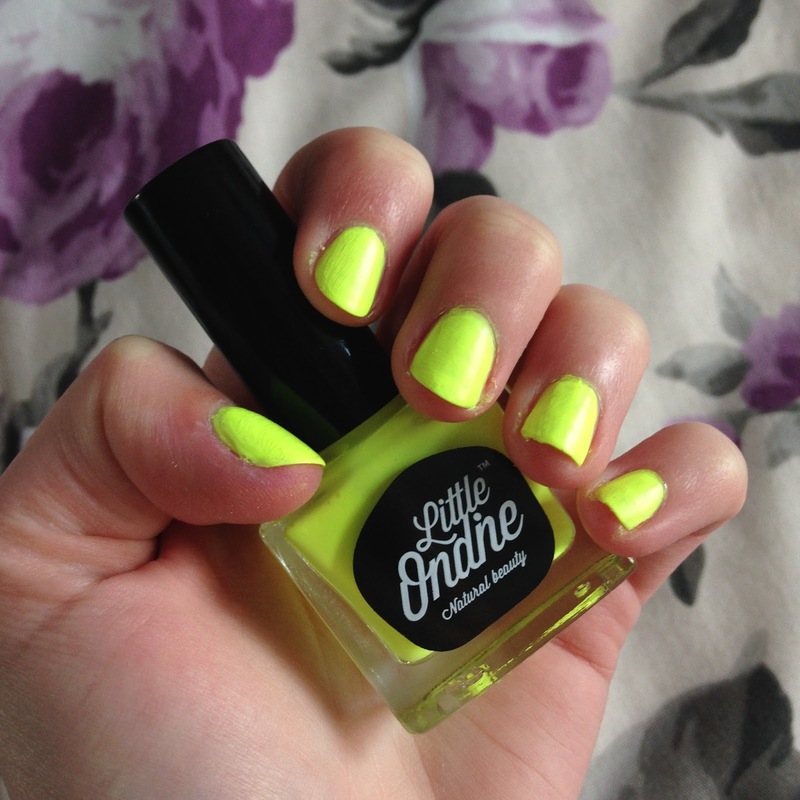 I'm a huge fan of luminous and neon colours on nails as I tend to wear pretty plain/monochrome clothing so this brightens up my whole look! The product was super easy to apply and was incredibly quick to dry! With normal polish it tends to take up to 45 minutes to completely dry on my nails, but this took about 1 minute. Yes, when I say one minute, I mean one minute! This is an absolute bonus for me considering I'm always in a rush. It seems that whenever I paint my nails and run out the door, they smudge on something before I can do anything about it! This product doesn't have that problem at all. However, because the product dries so fast you have to be really quick about correcting any mistakes. Normally, when I get a bit of nail polish just off the nail and onto my finger, I complete the rest of my nails and go back with a corrector pen and remove the mistake. With this product you have to tend to the problem immediately otherwise it dries onto the skin! This was a little bit of a pain when it came to painting my right hand (as I'm right handed, I'm sure many of you can relate to this problem!) but it was nothing that would put me off using the product, it just meant that I had to try and peel it off after it had dried which wasn't a problem at all. Once again, I think this product is absolutely perfect for an on-the-go sort of person! I'm constantly in a rush and barely have time to do anything anymore (as you may have been able to tell from my lack of blog posting recently) let alone paint my nails! This product takes literally 5-10 minutes to apply and then it's ok to walk right out the door. It does require about 3 to 4 layers as it is pretty see-through, but because it dries so fast it takes no time at all to add layer after layer! 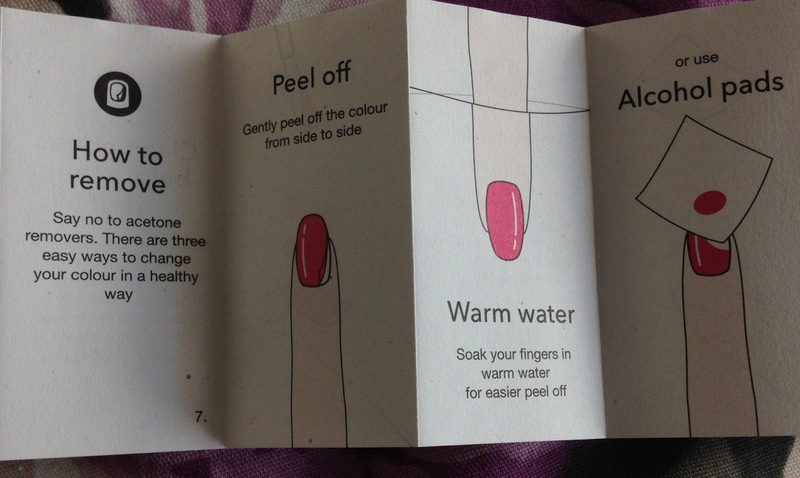 It's also the perfect product for anyone who gets bored with their nail colour easily. The removal process is so quick and easy that you could change the colour every hour with no hassle if you really wanted to! Overall, I think this product is so unique and amazing! I would definitely recommend to it anyone who's up for trying a product that's a bit different and new to anything else. 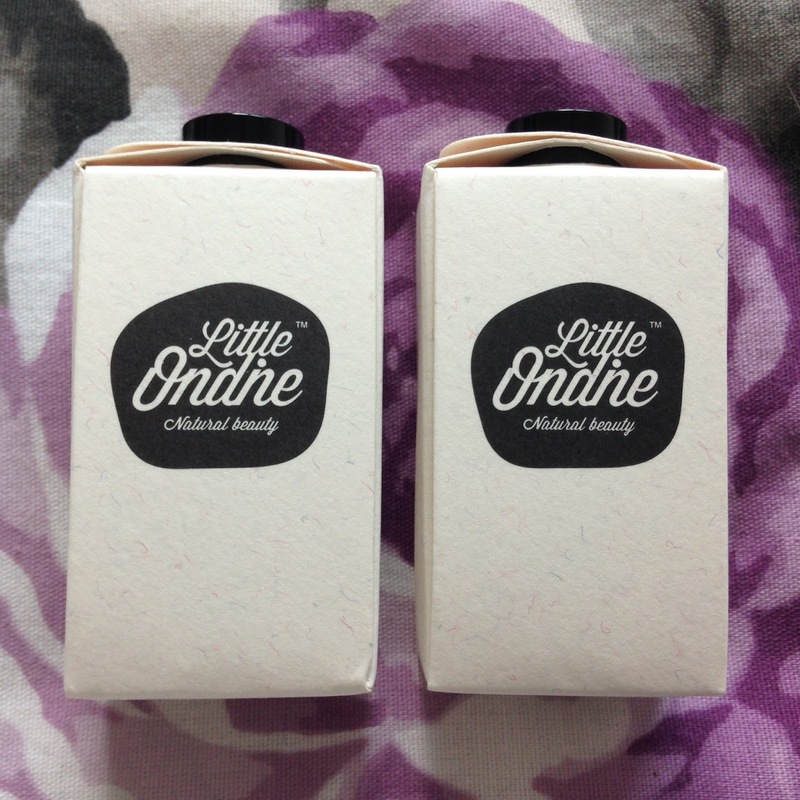 Little Ondine has an absolutely gorgeous range of colours and they are at perfectly affordable prices too! You can view their whole range here! Boom and Smack are also still available on their website too! 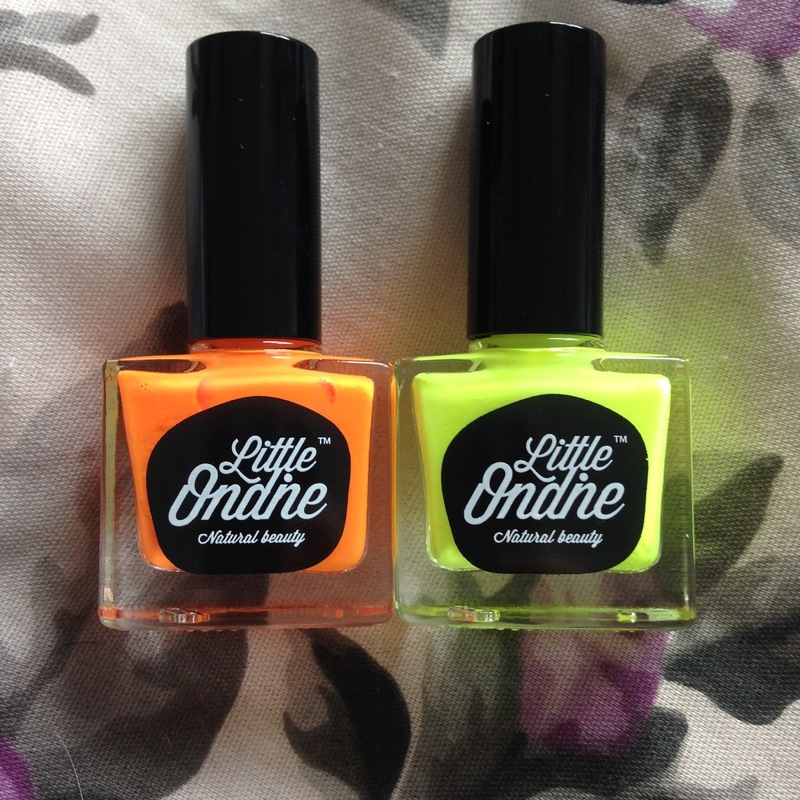 Have you ever tried any Little Ondine nail polishes or are you planning on making a purchase? What's your favourite brand of nail polish? Let me know in the comments, I love hearing what you all have to say! Wow these colours look amazing. 'Smack' looks particularly great, but the name makes that sound a little odd :')! wow amazing blog post ( as always) had a good read !! Very cool! I've read some great reviews on these! I'm definitely going to have to try them out, the peel-off technology is so cool! Great post! They have pretty colors of nail polish. Love it. I actually love the look of the yellow polish!